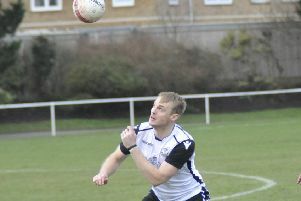 Hollington United Football Club’s first team produced what manager Scott Price described as their best 45 minutes of the season in Saturday’s victory. The Mid Sussex League Premier Division high-flyers were 3-0 up at half time en route to a 3-2 win away to AFC Ringmer in round two of the Sussex Intermediate Challenge Cup. Price said: “With only 13 players available and two of them carrying knocks, I did have concerns about the game. But our first half performance was easily the best 45 minutes of the season. “It was nice to watch the game and actually enjoy it. Again we’ve had to go with players out of position, but the way this team adapts to changes in shape and personnel is phenomenal. On the Lewes FC 3G pitch, the Lions started like a house on fire and took the lead when a Kian Moynes corner was headed back by Dom Clarke for Danny Andrews to head home. It was soon 2-0 and this time Andrews did it all himself, beating two players and curling an unstoppable shot into the top corner. Hollington were now in full flow, creating chances at will. The impressive Moynes was denied by the post and Alan Foster headed just over, but the third goal did come when another Moynes corner was again met by Clarke and Sean Ray headed home. The second period started in similar fashion, but the Lions didn’t punish Ringmer like they had in the first half. The game then went very flat and Hollington became a little complacent, leading to Ringmer scoring two goals in the last 10 minutes. A good result for Hollington, who will travel to Balcombe or Willingdon Athletic in the last 16. Man of the match, sponsored by Ideas Designed, was Foster. Hollington will host Burgess Hill Albion in round one of the Mid Sussex League Senior Charity Cup this coming Saturday. Kick-off at Gibbons Field is 1.30pm.